TSC Bredon 1st May finished off the first half of the 2016 Schools Challenge, what a fantastic day with typical Bank Holiday weather but that didn’t stop our young shots from putting in some fantastic scores! Some of those impressive scores include Henry Bevan, who even though in the Prep category was the overall high gun with a superb score of 49ex50, just beating the Senior George Martin who scored 48ex50. In the ladies again another Prep shone through, Shayla-Marie Ball scored a fantastic 43ex50. Jess Allan wasn’t far behind winning the Senior Girls with a score of 41ex50. For the first time in The Schools Challenge history we had a tie for Senior Boys Team 1st. Both Bloxham and Bredon shot 208ex250. This lead to a gripping shoot off between Bloxam and Bredon for the much covered top prize of the day, a Browning 525. Nick Von Sydow from Bloxham and Toby Hammond from Bredon, the team captains went head to head to shoot for 1st and 2nd place. The shoot offs took place and Toby secured victory for the Bredon A team with 8ex10 to Nick’s 6ex10. Our Champion of Champions for 2016 was George Martin from Bredon A with an exceptional combined score of 93ex100. Henry Bevan was close behind with a combined score of 91ex100. 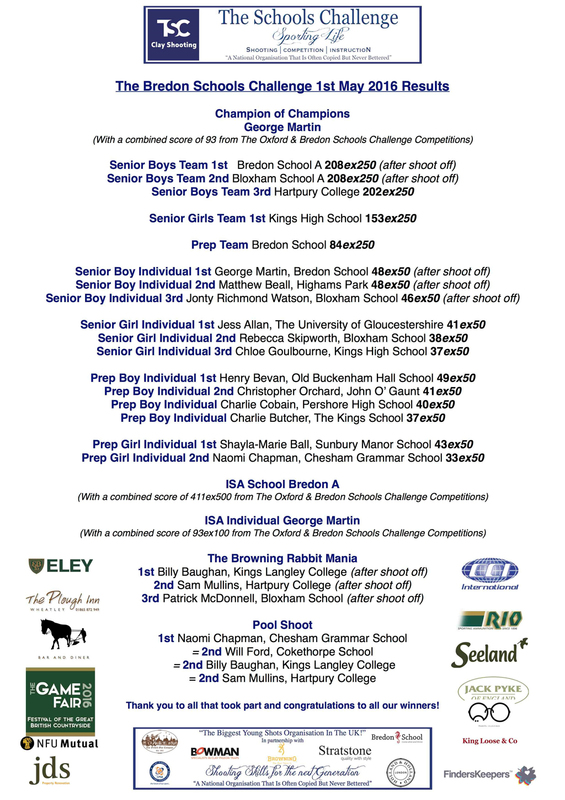 This year we had a new awards category, The ISA Team and ISA Individual, combining the scores from ISA schools that shot both TSC Oxford and TSC Bredon. The aim of this new award is to recognise shooting talent within the ISA schools and to get new ISA schools involved in shooting. Walking away with the trophy for ISA Team was Bredon A with a combined score of 411ex500. Pocklington just missed out on the trophy, coming 2nd with a combined score of 381ex500. The winning ISA Individual was George Martin with his impressive combined score of 93ex100. Thank you to everyone who made the journey to Bredon School and a final congratulations to all our winners! We hope to see you for The Winter Series, starting 8th October at The Oxford Gun Company.